Environmental Working Group Survey of canned-good brands finds endocrine disruptor hormone-mimicking compound still widely used. In a survey of more than 250 brands of canned food, researchers found that more than 44 percent use bisphenol-A lined cans for some or all of their products. A Family Guide – 20 Easy Steps to Personal Environmental Health Now is a health guide from the National Institute of Environmental Health Sciences. National Public Health Week (April 2-6, 2018). National experts in education, childcare, and children’s health issued a joint call to get the lead out of schools and childcare facilities. Their report, Eliminating Lead Risks in Schools and Child Care Facilities, is the first to set strategic priorities for reducing lead exposure to the more than 66 million children enrolled in schools and child care programs. CHEC (Children’s Health Environmental Coalition) is a national non-profit organization dedicated to educating the public, specifically parents and caregivers, about environmental toxins that affect children’s health. Their goal is to eliminate children’s exposure to man-made toxic substances by ensuring everyone’s right-to-know what is in their air, food, water and commercial products. The National Institutes of Health Sciences has a Website resource for kids, parents, and teachers to find fun and educational materials related to health, science, and the environment we live in today. 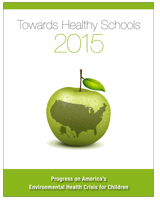 Towards Healthy Schools 2015 Report! The Towards Healthy Schools 2015 Report cites multiple studies documenting the benefits of healthy indoor learning environments on attendance and achievement, then presents state-level data and policy summaries. (Click report cover below to link to the full report). Texas Children’s Tips for Parents is a Web site of the Texas Children’s Hospital in Houston that includes the resource Providing a Healthy and Safe Environment for Children. Links are provided that outline how parents can keep their child’s environment healthy and safe. Tips to Protect Children is a resource provided by the Environmental Protection Agency to encourage responsible actions to reduce children’s exposure to environmental contaminants. Raising Healthy Children in a Toxic World: 101 Smart Solutions for Every Family is a book by Philip J. Landrigan, M.D. ; Herbert L. Needleman, M.D. ; and Mary M. Landrigan, MPA. The book describes how in today’s world, the air we breathe, water we drink, food we eat, homes we live in, and parks where we play are all susceptible to a host of environmental toxins. Although these toxins can affect everyone, those most at risk are our children.